New Year, New Juice Cleanse! This time I tried a new 3 day juice cleanse from a juice company called Skinny Limits based out of Austin, Texas. They found my site through Pinterest (awesome!) and asked me if I wanted to try out the Skinny Limits 3 day juice cleanse. Um…of course! 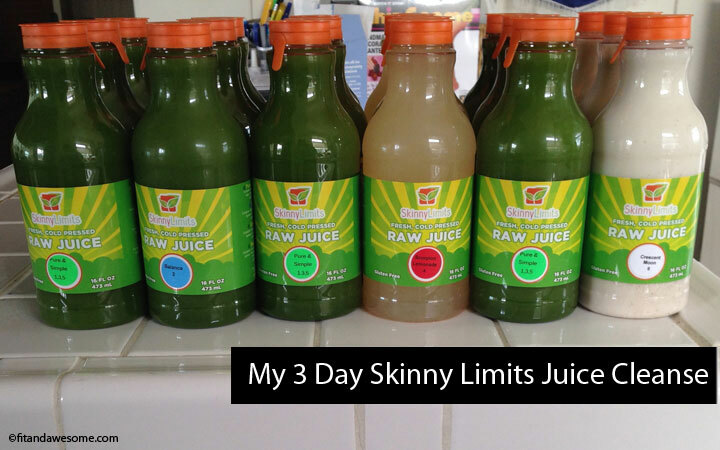 The Skinny Limits 3 Day Juice Cleanse ships nationwide which is how I got mine. All 3 days worth of juice arrived in a box on my doorstep. When I opened the box up, there was a foil bag. Some of the companies I have seen mail juice use way too much material in their packaging. Skinny Limits did not overdo it at all and I appreciated that. There are a couple different Skinny Limits 3 Day Juice Cleanse options to choose from: the standard, variety, and tropical. I tried the standard version which is 6 drinks per day – 4 green juices, 1 master cleanse style lemonade, and one nut milk. I unloaded the juices out of the box and lined them up in our refrigerator. When I commit myself to doing a detox challenge (or any type of challenge really) I commit 100% to it and I decided to begin my 3 day juice cleanse the following day. I woke up and wanted a cup of coffee. Then I remembered I was juicing. I popped open the first drink of the juice cleanse which was called Pure and Simple. It was a green drink made with kale, cucumber, spinach, apple, parsley, celery, and lemon. I hope it tasted good because this drink is 3 out of the 6 daily juices on the cleanse. Thankfully it was good. I enjoyed it. The second drink was called Balance. it had Kale, Cucumber, Spinach, Apple, Parsley, Celery, Lemon, and Ginger in it. I liked it because it tasted similar to the Pure and Simple juice but the ginger gave it a nice kick. I had the drink at about 10:30am before I went into a meeting and I was feeling fine. So far, so good. Around noon I cracked into my third drink – Another Pure & Simple. I’m so used to juicing now that the routine is very easy for me. I was moving along nicely when I got to drink #4. It was called the Scorpion Lemonade and is basically a master cleanse style drink. It’s made with lemon, agave, water, and cayenne pepper. I can’t say that this was my favorite drink. It was a bit spicy and sour but I was able to drink it down. Around 5pm I had my drink #5 which was my third Pure and Simple for the day. I’ve never done a juice cleanse where I drank the same drink multiple times in a day but I have to say I liked it. But by far my favorite drink of the day was drink #6. It was called the Crescent Moon and was made with Raw cashews, Vanilla Bean, Cinnamon, Agave Nectar, and Filtered Water. After drinking green juice all day, this drink was like heaven. I took small sips of it because I wanted to savor it. I drank a little bit of it and decided to save the rest until after my soccer game. I went to soccer and have to say that playing soccer was the first time all day that I felt the effects of my detox. I had a horrible headache in the back of my head and I felt overall sluggish and tired. I could barely run. I felt like a tree because I was barely moving. I felt bad I didn’t run harder but I physically couldn’t. After the game I drank a lot of water, came home, and had the rest of my Crescent Moon drink. I took a shower and went to bed. Day One: Check. I woke up feeling hungry. I hate when I wake up feeling hungry on a juice cleanse. I went to the bathroom and had some nice “detox” effects. Yes, I went there. Why? Because I’m surprised. I didn’t eat anything solid. How did solids come out of me? Okay, moving on. Enough about my detox experience. This day I also plowed through my juices. 9am-3pm are easy for me. It’s that afternoon slump that’s the hardest for me to get through. It’s usually the time of day where I have a snack or another coffee or tea so I’m pretty sure that’s why. Did I mention that giving up coffee is extremely hard for me? I love coffee. Even reading people’s tweets about coffee were giving me a headache. But this is why I go on periodical breaks from coffee just to remind myself how wonderful it is! One thing that was challenging for me was my juices froze. Apparently I stuck them too far back in the fridge and they became half frozen. This made drinking some of the juices tough. I ended up pouring water in some of them just so I could make sure the ice melted in the juice and I could get all my nutrients. Note to self: do not stick juices too far back in fridge. I found it pretty easy to stay on my juicing path but I did go visit my parents and my dad wanted to cook a pizza. I can’t have pizza anyway unless it’s gluten free but just the thought of something warm and filling to eat sounded so good after my frozen filled juice day. I got home around 7pm and drank my last juice – the Crescent Moon nut milk. That drink is heavenly and is something I was looking forward to. Glad it lived up to everything I hoped it could be! I cleansed from a Wednesday – Friday and on Friday I woke up thinking “yay, I can eat.” Then I remembered that I was still cleansing. Day 2 was a bit rough with a good portion of my juice being frozen so I was determined to make sure I didn’t make the same mistake again. I was able to get through all of my drinks pretty easily and honestly as I saw them dwindling down in the fridge I got a little bit bummed. I feel so good when I drink nothing but fresh green juices and nut milks. I wish I had the willpower to do it for longer periods of time than 3 days. I went through the day and honestly, I was very hungry. I think it was because I took the dog for a big 2 mile walk in the morning and another 2 mile walk in the evening. It made me hungry! All I wanted to do was eat. I told my friend I wanted to break the fast and she said I should do what I feel like. Hmm..I felt like something substantial to eat. But my stomach felt so good and I didn’t want to ruin it. Decisions, decisions. My husband ordered take out for dinner since I was juicing and didn’t cook. He asked me if I wanted to break the fast and go out to dinner but I said no. I have to stay true to my commitments. And I did. But after I drank my final nut milk I still wasn’t satisfied. That was not good. I didn’t want to break the fast so what I decided to do was boil water and drink a cup of Yogi Tea. I heard the tea is okay on juice cleanses as long as it’s not caffeinated. I had some Yogi Tea. I was not satisfied. I had a 2nd cup of Yogi Tea and still was hungry. This was when I gave in and decided to heat up 2 cups of chicken broth. I ate the chicken broth and it was delicious. At first I was upset at myself for eating the chicken broth but then I thought to myself “wow, I’m getting mad because I had chicken broth. There are so many worse things I could be eating right now.” So I decided to not be upset with myself and instead congratulate myself on another 3 day cleanse challenge completed. Thank you very much to Skinny Limits for providing me with the Skinny Limits 3 Day Juice Cleanse Program. I loved that your program focused primarily on green drinks. It was great! What about you? Have you ever done a juice cleanse? How did you feel? Do you like them? Post in the comments and let me know. Kudos for the honesty. I’ve always wanted to try a cleanse but it’s one of those things that sounds good in my head that I know I couldn’t handle physically. Maybe someday….! I am nothing if not honest. If you ever want to do a juice cleanse I will totally do it with you! I’d be afraid to do a cleanse like that. I’d have a mondo headache and probably be useless to anyone. Then my husband would still expect me to cook. That Crescent Moon drink sounds super delicious. I would never do a juice cleanse during the university quarter because it would make it too hard for me to teach. Maybe in the summer or winter break. I’ve considered doing a juice cleanse but to be honest there aren’t any stores around here that sell the products I would be comfortable taking. Especially right after the holidays. Ugh, all the sugar (but it tasted sooo good). These juices sound good. Are they only for fasting or can they be incorporated into a daily diet? I did one juice cleanse. I signed up for 5 or 7 days – can’t recall. I made it for three days and completely cracked. It was rough. I experienced a lot of the symptoms you did, but in only three days I also noticed a lot of positive things. My skin looked so good by day three! I would love to do it again – for three days – and see how it goes. This was a great review! I love how honest you are, most people review cleanses and never mention the hunger and headaches involved, not to mention the cravings. It’s nice to know that even people we look up to for guidance and inspiration in healthy living (you) are human. I love juicing and detoxing for health and longevity benefits. I actually did fasting and cleansing research for disease prevention in my undergrad years. Detoxing is hard, especially from coffee as well. Headaches and hunger are the worst parts for sure. I used to do a ton of different cleanses, but ever since I developed my own to sell I only use that one. I found a way to avoid hunger by allowing whole vegetables a couple times a day instead of just juice. It’s delicious, filling, and has the same effects of other cleanses. So nice to meet you at the Lorna Jane event last Saturday!